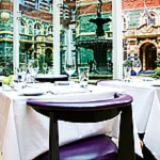 "Situated in the midst of St James’s, the restaurant offers an abundance of charm, colour and character. 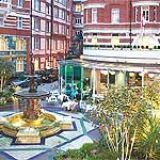 From the impressive bar to the elegant and relaxed dining conservatory with its tranquil courtyard backdrop, Bank Westminster is a fantastic location in which to relax and enjoy great food and drink. We’re about classic and inspired seasonal cooking, amazing steaks and brilliant cocktails to match. We only serve the very best British and USDA Angus beef, naturally reared on farms selected by us. We pride ourselves on the philosophy of ingredient provenance and are dedicated to ensure that every time you visit us, you will have fantastic food and service." What did you think of Bank Westminster? Bank in Westminster is one of my favourite restaurants in the city. The setting is very tranquil and it uses its surroundings to create a lovely atmosphere. The food has always been top quality for me! If you're even a little claustrophobic give Bank Westminster a wide berth between the hours of 12 and 2. I've tried it twice and both times felt like a prize heifer at a cattle market! Busy just isn't the word. I've never been to Bank Westminster in the evening, but friends say it's a lot more relaxed. I came to Bank Westminster after work to have a few cheeky drinks, I choose from the cocktail club menu which was slightly cheaper menu but that just meant i got to have more! Bank Westminster has it all! a beautiful restaurant in such historic surroundings. Some may argue about the price however make no mistake you are paying top money for top food and service ! Bank Westminster is a lovely chic restaurant that i found randomly and the food is amazing. 2) The quality of food at Bank Westminster is great; the aged fillet steak is Definitely my favorite. If me and the boyf fancy a splurge we head here. I like the sleek vibe and I can't get enough of those lamb shanks, especially when the winter sets in! A reliable haunt for the suits of Westminster, Bank is sleek, loud and a little bit expensive. Just how they like it. Bank is something of a strange beast; it feels a little like it's been squeezed into its handy location right next to the Crown Plaza St. James. 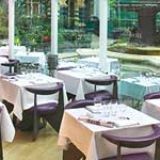 Everything about it certainly looks impressive, with swathes of immaculate whites, pristine glassware, plum leather seating and a very attractive conservatory (complete with quaint views of the hotel’s small courtyard) combining to serve up enough sheen to keep the business lunches flowing. It’s actually getting to the spacious conservatory that feels a little claustrophobic, with a long corridor squeezing you past private dining rooms with semi clear windows that make them look just a little bit like meeting rooms. It just about manages to get away with it though, thanks primarily to an arrestingly sleek décor, and that impressive area to the rear. Bank is a firm favourite with the suits, so lunchtimes are rammed with diners battling it out to whack it on expenses, whilst evenings see after work drinks extending to dinner. It certainly has a vibrant atmosphere - perhaps too much so - with a din that can rise to a level that makes conversing with the sometimes quiet staff difficult. Luckily, the animated chatter is appreciative and happy, which is certainly a better alternative to any hushed tones of reverence. The menu doesn't offer anything particularly innovative, but what it does, it does very well indeed, so don’t let the slightly lofty prices (or the lack of brown bread) put you off – they certainly don’t anyone else. It’s a menu for all seasons, with firm British favourites sitting next to Greek mezze, tastes of the Orient, pastas and that old favourite, the chicken tikka masala. Don’t let that put you off either though, because as the starters prove, there’s obvious care into what comes out of the kitchen. A spiced parsnip and apple soup (£5) is well balanced and generous, even if it could do with a little more body and spice, whilst the chilli squid Thai noodle salad (£8.50) is generously spiced, with clean flavours of chilli and ginger cutting through perfectly tempurad squid. Mains are equally good, with a fragrant and beautifully presented Malayan spiced chicken breast (£17.25) cooked nicely and served with sweet potato in a coconut and lime broth. It’s not quite as impressive as the lamb shank though (£18.50), slow cooked to fall off the bone just as easily as it should and served with loads of root vegetables that retain bite and swim in a deliciously rich jus. Sides are certainly adequate, with a creamy mash (£3.95) and a pak choi with chilli and garlic (£4.35) being particularly good. Desserts keep things more British, with apple pies and custard, sticky toffee puddings with butterscotch sauce and chocolate fudge puddings with vanilla ice cream coming in at £7.25 each. At those prices they better be good, and thankfully they are: a motto for the menu, perhaps. An excellent wine list keeps most of the diners happy, and boasts that pleasing knack of sweeping from the affordable to the relatively extravagant without being overlong. An organic Chilean Chardonnay is available by the glass (£5.50/£7.50) or by the bottle (£22.50), and its fruity, clean and crisp notes mark it out as pretty good value. The house red is a decent Italian merlot at £23.95, on a list that rises to a £135 Rioja, but if you really want to impress (or are on good terms with accounts) then you can splash out on £160 Dom Perignon Reserve or £295 Cristal, both from 2000. Solid, if unspectacular, Bank is one of those places that certainly has enough good things to make it worth heading to, including food that just about justifies the ever so slightly elevated prices. I paid top dollar to dine in this fancy place and boy was it worth it. Great food, great service and a lovely atmosphere. Will return sometime soon! Thank you so much for taking the time to review us. We are glad you had a great experience and we hope you will come back and dine with us soon! The cocktails and food were made perfectly and the service was on point at Bank Westminster. Bank Westminster is one of mine and my hubby’s favourite haunts for a cheeky daytime cocktail and lunch. I love the setting and the ambience - conveniently located but a little hideaway at the same time. The service and atmosphere at Bank Westminster was smashing and I couldn't fault the food at all. 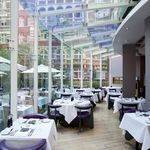 The conservatory area in Bank Westminster is a lovely setting to have dinner. The atmosphere was lovely and service was superb. I popped by Bank Westminster one Saturday with my family and it didn’t disappoint. The food and service were great. The food at Bank Westminster is to die for, it was all cooked perfectly and the dessert was amazing which was my best part! I definitely recommend Bank Westminster to anyone looking to eat in the city. Make sure you visit the Zander bar first though for a few nice cocktails. The cocktails I had with my meal at Bank Westminster were out if this world. The service was very friendly. Atmosphere brilliant. Bank Westminster were very welcoming, nice relaxed atmosphere, food excellent, would certainly recommend it. The steaks at Bank Westminster were cooked to perfection when I visited last week and the cocktails were tasty too. I came to Bank Westminster with a few friends for her birthday and the food was absolutely smashing. We had booked a table at Bank Westminster for my Dads birthday and they were very accomodating and the food was lush. Bank Westminster is good if you're a suited, business type during the week but otherwise it's a bit corporate. Great food though, I have to say. Bank Westminster is always one of my first choices when heading out for lunch in the City. The shared plates are always a great choice for my colleagues and myself at lunch. As with most City restaurants, Bank focuses heavily on fine food and service but I would also mention that the wine selection is great also. I try and visit Bank Westminster whenever I am in the city, always-lovely food and professional service. I went with a colleague to Bank Westminster a little while back and although the food was pretty good, the predominance of suits on Christmas jollies did spoil it a little bit for me. I'm sure Bank Westminster is fine when less busy but it can get a bit braying. I love Bank Westminster, such a pretty restaurant. The service cant be faulted and the food is always perfectly cooked. Wow! I have recently visited Bank Westminster for the first time and was blown away by the style and sophistication. 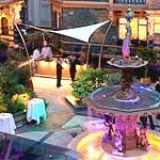 The restaurant is decorated very elegantly and the picturesque fountain is a great backdrop. The steaks are priced fairly and cooked superbly in Bank's indoor BBQ grill. Will definitely be returning when looking to treat someone! I absolutely love this place. Right from the moment I walked past the beautiful water fountain and through the doors, i was blown away by its elegance. We were seated in the gorgeous conservatory looking out at the green brick of the surrounding buildings. I think the effect was really unusual and almost ethereal to me. Then the food came and not only was it reasonably priced (from the decor I was assuming it would be astronomical and was pleasantly surprised when it wasn't) it was some of the best food I have ever had. Will definitely be returning! To escape the hustle and bustle of St Jame's I stopped off at the Bank Westminster for dinner, for an unofficial business meeting. It ended up a little boozy and consisted of steak and cocktails! The food was top draw and the cocktail were great, considering I found this by chance I will be back again! Popped in to escape the atrocious weather yesterday afternoon to have a quiet drink with a friend and ended up staying until closing. Such a hidden gem! Well made cocktails at extremely good prices - £4.75 for a superb list of selected classic cocktails, friendly, knowledgeable staff and a beautiful dining room overlooking a courtyard. The decor is a bit "early naughties" and is in need of a refurb, however the quality of the food and drinks are what really counts. Will definitely be going back!! Bank Westminster and Zander Bar was a lovely surprise. Staff was polite and helpful. Service was slick and efficient. We ordered a variety of dishes from the a la carte and set menus. The food was very well cooked and seasoned. The wine list was extensive and reasonably priced and the conservatory setting overlooking the gorgeous courtyard was outstanding. We will be returning again. I had a really bad experience at Bank, from the booking not being on the system to the snooty female manager not even acknowledging us. The only saving grace was the food.